Nissan Motor Co., Ltd., and Groupe Hasnaoui will invest a total of $160 million in a new Nissan vehicle plant in Algeria to meet growing customer demand in the country and across Africa. The two companies will set up a joint venture in coming weeks, having received approval by the Algerian government on Dec. 6, 2018. The plant will have the capacity to build 63,500 passenger cars and light commercial vehicles annually, and will produce several models. Details of the lineup will be announced at a later date. Nissan aims to double its presence in the Africa, Middle East and India region over the course of the company’s Nissan M.O.V.E. to 2022 midterm plan. Expanding industrial operations into new markets, like Algeria, is part of the growth strategy. The move into the market follows Nissan’s announcement last year that it will start making cars in Pakistan. Algeria is forecast to be the second-largest car market in Africa by 2021. The government is working to diversify the economy and has set a target to ultimately raise production to 500,000 cars a year, while growing the local supplier base. The Nissan car plant is expected to create at least 1,800 jobs in Algeria and support many more in the supply chain. Nissan teams from Japan will work with suppliers in the country to develop the local component industry through technical support, training and skills exchange. Groupe Hasnaoui, founded in 1964 by Abdallah Hasnaoui, is a major player in the Algerian economy with interests in industry, distribution and services. 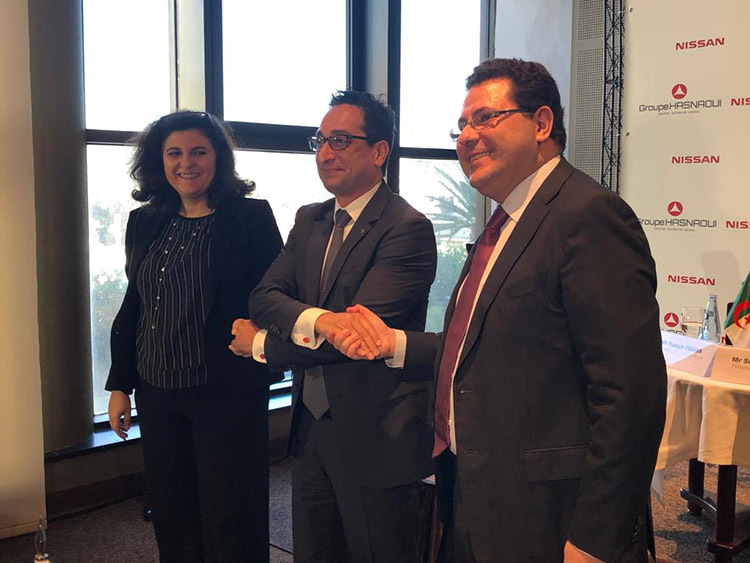 The company is committed to creating value in the Algerian economy and is headed by its two co-presidents, Feriel Hasnaoui and Sefiane Hasnaoui. Groupe Hasnaoui is Nissan’s distributor in Algeria. The two companies have been partners for 25 years. “With an industrial strategy based on employment and localization - the only guarantees of our country’s economic development - and a real creation of sustainable value for our national economy this investment will give us the status of wealth creation and generate industrial expertise,” said Sefiane Hasnaoui, President of Groupe Hasnaoui. The new plant in Algeria will increase Nissan’s total potential capacity in Africa to about 200,000 vehicles. The number includes existing factories in South Africa, Egypt and Nigeria. Nissan Algeria – a subsidiary of Groupe Hasnaoui – will also expand its existing national network of 35 outlets in line with an anticipated increase in sales volume that will place Nissan within the top tier of auto brands in Algeria by 2021. Get more information about Nissan in the AMI region here.